West Des Moines, IA, January 16, 2019 --(PR.com)-- Tractor Zoom, a leading advertising platform for bringing farm equipment auctioneers and buyers of high-valued farm machinery together, and Wavebid, makers of the leading auction management software, announced a partnership today designed to improve the online advertising experience for farm equipment auctioneers. The integration allows a Wavebid auction customer to advertise farm equipment auctions on Tractor Zoom with a single click. The two companies are integrating the superior cataloging functions of Wavebid with the modern advertising platform of Tractor Zoom to create a more powerful solution for their mutual auctioneer customers. This integration helps auction professionals get their auctions in front of more buyers and bidders quickly and seamlessly, helping to increase their reach and brand awareness. Tractor Zoom and Wavebid’s shared vision of their partnership is to put powerful digital tools in the hands of auctioneers, so that they can continue to succeed and serve their clients in an ever-changing technological landscape. Auctioneers will be able to create, edit, export, and advertise their auction inventory to high-quality buyers more quickly and easily than ever before. Tractor Zoom is a farm equipment auction marketplace that aggregates farm machinery auctions from multiple auction companies. Tractor Zoom makes it simple for farmers to find upcoming farm equipment auctions and search their inventory. Auctioneers can contact Tractor Zoom at info@tractorzoom.com to learn how they can advertise their auctions for free. 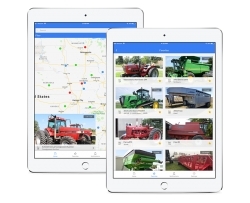 Users can view all upcoming auctions and their inventory on tractorzoom.com, or by downloading Tractor Zoom’s free mobile app from the Apple App Store or Google Play Store. Wavebid is a SaaS company that provides practical business solutions to help the auction industry navigate the auction world. Wavebid solves the most urgent issues within the auction industry by offering a cloud-based software that helps with the back-end side of auction management. Over 1,000 users count on Wavebid to provide solutions for cataloging, clerking, business management, and web design. For more information please visit: www.wavebid.com.